At Elegateau Cakes London, cake is our passion. When you are as passionate about them as we are, cake making turns into more than just that. It becomes a way of truly expressing yourself – or the personality of a customer who needs a special birthday cake or the couple with a specific wedding tower in mind. We always help our customers get the gateau they desire, and we do this with our classically trained bakers and our award winning cake decorating and Royal Icing specialists. We persistently aim to create cakes that almost look too good to eat. Almost. It was no different when we took Te Fiti on. The fact is when you have been making cakes as long we have, the way you see the world changes slightly. Everything we see around us raises the question, ‘How could we make that out of cake?’. We take our inspiration from everything around us, from architecture to films to the deep recesses of our minds. And so, we always look for new challenges… new ways of fulfilling our purpose of crafting the most immaculate art piece known to cake. One source of inspiration that truly stuck was the film Moana. For us, there is no greater way of showing you’re inspired than to put your heart and soul into a breath-taking show-piece. In the case of Te Fiti, we fell in love with her from the moment we saw her. And who can blame us? She is an absolute vision of beauty and vibrant life. 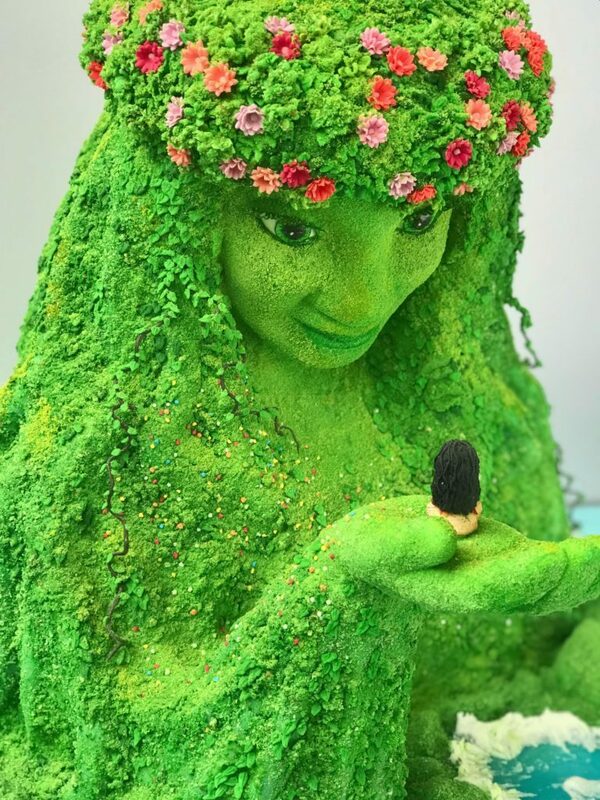 Te Fiti is a goddess with the power to create life and so we made it our mission to bring her to life with this piece of art. Our team loves making cakes with a plethora of details and so we felt truly equipped to take the task on. One week, we finally got the chance to do it. This was really going to be a labour of love and we couldn’t wait to get started. There was a moment in the film we knew we wanted to re-create. Spoiler alert! If you’re yet to see the film scroll down to the next paragraph. We chose her pose from a pinnacle moment in the movie. This is the point when Te Ka turns back into Te Fiti and raises Moana up in a gesture of gratitude. We picked this scene because it is a truly memorable moment. It’s full of emotion and passion and it evokes such joy. It was a wonderful exchange – what better pose to craft her in than this one? We knew Te Fiti would be a labour of love. And that she was. She was four whole days of technique, detail and experimentation. Every edible piece of art we craft is bespoke and unique, and this one was no different. We had a team of two dedicated to this particular project and it took imagination, persistence and vision to bring our show-piece together. We first built the internal structure to support her arm and body. Gone are the days when the utensils required to make cakes are simply a spatula and some measuring spoons. The modern cake artist requires all those things of course, but they also require drills, fasteners, and power tools to perfectly shape their art. Luxury novelty cakes not only have to taste delicious, but they also need to look as perfect as possible. They exist to remind people of something, somewhere or someone they truly love or are inspired by – so getting her shape right was important. Once we finished creating the basic shape, we then covered the entire piece in a layer of sugar fondant and that was when she really came to life. We knew that we had to capture the organic and natural appearance of the character so we experimented with many edible mediums to create the velvety, moss-like texture. It was soon time for our Moana duo put the finishing touches on Te Fiti and the details were of the utmost importance. Time went into each bit of her intricacies. Her tone of green, the little leaves and flowers, and sweet Moana in her hand were all deserving of a just amount of diligence and delicacy. We think we got it! When finished, she stood at an astonishing 17” tall. She was finally ready to show the world – and the world really saw. We posted a video of the finished piece on our Facebook on the 20th February 2018. We can’t even describe what happened next. It goes to show how powerful social media is. Our video was shared by a range of food lovers’ pages and a wealth of pop culture sites and the result was phenomenal. We have been absolutely overwhelmed with how much people loved our work. We love doing what we do but there is a certain magic about sharing these pieces with people and knowing they enjoy them as much as we do. Our interaction with prospective customers has increased. This is great because working with people who need their birthday, celebration or wedding cake dreams fulfilled is what we aim to do. After the tremendous feedback from people, we are excited to continue perfecting our craft for people with all kinds of requirements. We can’t wait to start our next project and share it all with you. We will absolutely continue to use video to showcase our work. There have been a lot of curious cake makers, asking us how we’ve put Te Fiti together and how to go about making show-piece cakes in general. For our next creation, we will be sure to invite you on to the journey with the recording of videos from the beginning to the end of the process. We can’t thank everyone enough for the interest in our work. We rarely ever make the same cake twice – so it was amazing to share this one piece with so many people.